When prompted on Twitter, Canadian Treasury Board President Tony Clement responded by saying “no” to questions asking what he thought about the Australian decision to eliminate the information commissioner and whether the Harper government had considered doing this in Canada. Legault is slated to release her annual report to Parliament Thursday, following up on a 2013 report that warned of significant failures and deterioration within the Canadian government in respecting Canada’s freedom of information law. The annual reports generally update progress or problems within departments in addressing concerns about whether Canadians are getting timely access to government information upon request. The new report could also specifically provide an update on recent investigations of lengthy delays at Transport Canada in response to requests for its rail-safety records in the aftermath of the Lac-Mégantic runaway train disaster from July 2013. Investigations, prompted by complaints from media outlets such as Postmedia News, revealed last fall that employees were directed by Transport Canada management to delay the release of records and focus on other priorities following the tragedy that claimed the lives of 47 people when the train carrying oil crashed into buildings of the small town in a fiery explosion. Transport Canada said it was forced to delay its response to access to information requests, including a request for an audit from 2006, so that it could focus its resources on responding to the crash. The commissioner’s office noted in its investigations that this excuse wasn’t valid. Canada’s Access to Information Act, which first came into force in 1983, requires government organizations to release federal records upon request, within 30 days, to Canadians who pay the $5.00 fee. The legislation also allows federal officials to censor or withhold information in certain categories such as cabinet secrets or matters of national security. It also allows for time extensions depending on the size or nature of the records requested. The information commissioner’s office in Canada was set up as a watchdog to monitor government performance and investigate complaints. Legault made her comments about the Australian situation after delivering opening remarks and taking questions from employees at an all-staff meeting, which was held to focus on new priorities for the last three years in her mandate. She described the office of her Australian counterpart, John McMillan, as “one of the best initiatives in terms of open government,” noting that it had order-making powers, policy-making powers as well as an education role to engage and inform the public. These provisions are not part of her own mandate in Canada. The Australian office was created by former prime minister Kevin Rudd’s Labour government in 2010, but then dismantled in a May 2014 budget by the newly-elected coalition Liberal government of Prime Minister Tony Abbott. The new Australian government estimated it would save about $10.2 million over four years by eliminating the office and transferring its responsibilities to other offices. Responding to questions about turnover and staffing capacity in her own office, Legault said it was also working on modernizing its manuals for investigators, exploring ways to improve its own communications about its work with the public, and keeping up with emerging Internet trends such as Twitter and other social media tools. But she urged staff to persevere in their work and not be frightened by what was happening in Australia, even though she noted that Parliament was ultimately responsible for deciding their future. She said this was how the office should continue to do its work. “That’s the only way I know that this office can continue to function, keep its credibility, its reputation and the value of its work. the rest belongs to things that we cannot control,” Legault said. 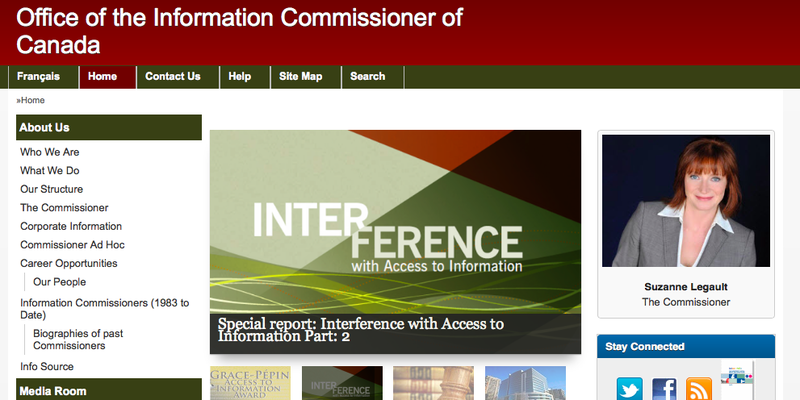 Disclosure: I attended the information commissioner’s all-staff meeting after accepting an invitation and contract to deliver a presentation about how journalists use the Access to Information Act and how we view the performance of departments and the commissioner’s office in response to requests, complaints and investigations. This entry was posted in access to information and tagged access to information, atip, Australia, Canada, Conservative Party of Canada, freedom of information, John McMillan, Kevin Rudd, Lac-Mégantic, Suzanne Legault, Tony Abbott, Tony Clement, Transport Canada by Mike De Souza. Bookmark the permalink.